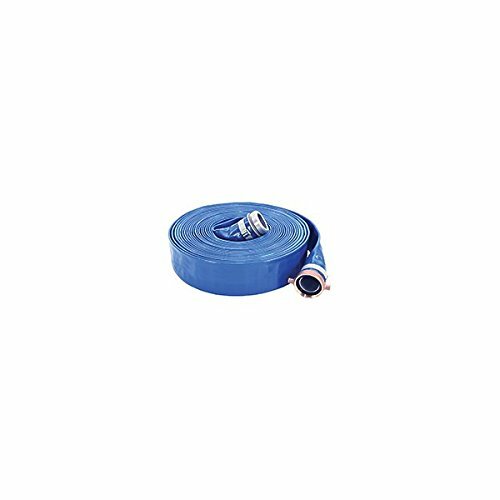 A blue PVC discharge hose for water, light chemicals, and pumping service in the agricultural, rental, construction, marine, and irrigation industries, this hose is strong, lightweight, non-water absorbing, and mildew-proof, and rolls up flat for easy storage. This hose is recommended for open-ended discharge; connect it to the discharge side of a pump system only. Construction: The tube/cover are PVC, reinforced with 3-ply polyester yarns, one longitudinal ply and two spiral plies. Both tube and cover are extruded simultaneously to obtain maximum bonding. Assemblies: Coupled with male x female aluminum short shanks with Band-It clamps.